Leslie Jerkins Reads: Matching Shoes, etc. I'm home from my business trip; everyone is in tact and happy to be reunited! What was waiting for me when I got home? The Mommy version of this bandwagon we hopped on and oh man I'm so excited. Can you stand it? Mommy-daughter Saltwaters! eeeek! Great price on the mom version, but whyyy are kids' version a mere $5-10 less? Why are kids' shoes so expensive, in general? Doesn't make sense that these are so close in price and so different in scale. Ok, so my photoshop skills are admittedly deficient. I sat down to make this little collage on my favorite nail polish shades because I thought it would be an easy exercise. But for some reason, it turned into this ongoing disaster where I would create the jpg and then when I uploaded it into the post and made it full-size, the top two nail polish colors changed completely and looked awful (and defeated the purpose of posting about nail polish)? I don't understand at all. So that's why it's small. Help? Anyway, these are my favorites right now (if you click to enlarge this image, you can see how the colors change!). 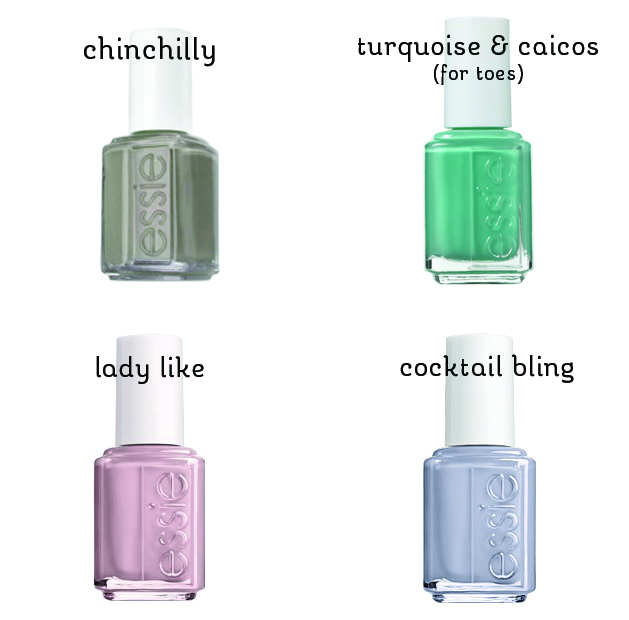 All Essie, as you can see. That Chinchilly is much grey-er in person than it looks there, and I love it. Any nail polish colors you've been loving lately? Off to take a break from screens and read a book (or unpack?). At least that won't change colors on me (I hope). Love SunSans! And you're so right about expensive kiddie shoes. I felt like $30 for sun sans at Cottontails was high (they were R's first "real" pair of shoes), until I went to buy Riggs some boots the next fall...even stride rite was like $50! Crazy.